Toyota Twin Cam powered Lotus Super Seven replica….. Flying High In Seven Heaven! George Fejer had a small shop in Newmarket Ontario just north of Toronto. Smitten with curiosity I ventured up for a peek on my next set of days off. Well, I have seen tidier shops in my time, but none so beautiful. These perfect little Lotus replicas were rolling out, and people were buying them up as fast as they could be built. I was hooked! You have to be pretty crazy to buy a Super Seven in the best of climates. With no heater and limited protection from the elements, the word obsessed comes to mind. None of that mattered now, our emotions had clearly clouded our normal intelligence Paul sold his mint, modified BMW 2002. I sold my Mustang Cobra and we ordered two of the Twin Cam versions. A rusty old Honda Civic was purchased as my winter transport and the wait began. As I recovered from horsepower withdrawal, I fabricated a custom walnut dashboard for my Seven, with the help of my friend, Peter. Many other parts were removed from the unfinished car for chroming. The front A-arms, springs, roll bar, grill, and other bits were plated and reinstalled. A good friend returned from England with a lovely, walnut Lotus shift knob. An Architect in California sent me reproduction MGA twin cam badges for the dash and engine cowl. Slowly, it all came together. Spring finally arrived and so did the cars. Paul’s Seven was dark metallic gray with black interior and mine was British Leyland blue with chrome and wood trim. Original Lotus crests from San Francisco and stainless steel fender guards finished the detailing. Our own modifications continued, some to make the cars better and others to set them right. We formed our own quality control organization. When I found a problem, I’d tell Paul, and he would do the same. We had lengthy discussions about differential failures, loose carb jet holders, fried alternators, and broken throttle cables. We would put them up on blocks in the winter, and try desperately to keep them off the blocks in the summer. I diligently keep a logbook of every repair and modification. It’s pages filled fast. 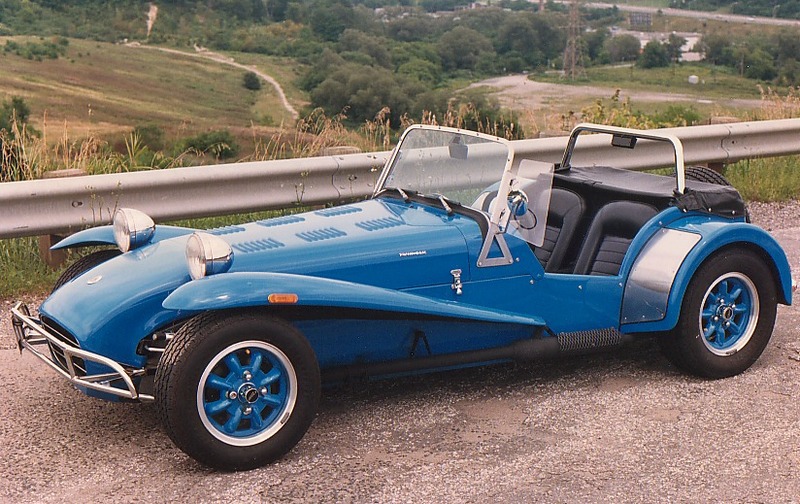 It amazed me how a Canadian replica, with Japanese internals could be so true to its unreliable British sports car roots. It broke a lot, I fixed it often and drove it with abandon every chance I could. Our fellow aircraft mechanics had mixed reactions. When the cars were broken, they all thought Paul and I were crazy. When the cars were running and we wailed out of the parking lot, smoking tires, we only confirmed their suspicions. The senior mechanic on my crew took me aside one day and with fatherly advice said, “If I owned that car, I would never drive it that hard.” My response was honest, “If you owned it for more than a week, you just couldn’t help yourself.” Its power and handling was infectious. It was a dream, come true. They were the holy grail of bare bones performance sports cars. It was loud, brash, pretty, and very fast. Whenever it was standing still, it attracted a crowd. When it was rolling, hunting for Porsche on warm Toronto nights, it was absolute heaven on wheels. Reality soon caught up with me. When my son Spencer was born, responsibilities prevailed and the Seven had to be sold. My last jaunt was a brisk November delivery from Toronto to its new owner in Montreal. In Quebec, I turned the key for the last time, tried to ignore the backache, and signed the papers. I climbed aboard an Air Canada 727 and was back at home before my kidneys had fully thawed. The small profit I made on the car was not important. The experience of owning that car remains a treasured memory. Its new owner, a true Super Seven fanatic, gives it nothing but the best, and this warms my heart. Recently, on a fine autumn day, thanks to Paul’s generosity, I had a brief chance to relive my reign of ecstasy behind the wheel in that tiny cockpit. Our friendship is sealed forever, because for three, hot, grease-stained summers, we shared the same dream, two exciting cars and a crusty, communal axle-puller. Super Seven heaven indeed.